The beat and rhythm of popular music is often enhanced with anticipation and syncopation. Anticipation means playing a note ahead of the beat it’s written on in the ‘straight version’ (if any exists). Syncopation is a general term for playing off the beat, especially when two hands are involved. In some countries in the past, syncopation came to mean playing popular music in piano lessons, as opposed to playing only classical music. If you don’t read music well, this illustration should solve the problem. Check you’ve got the right notes against the audio file under the first illustration. 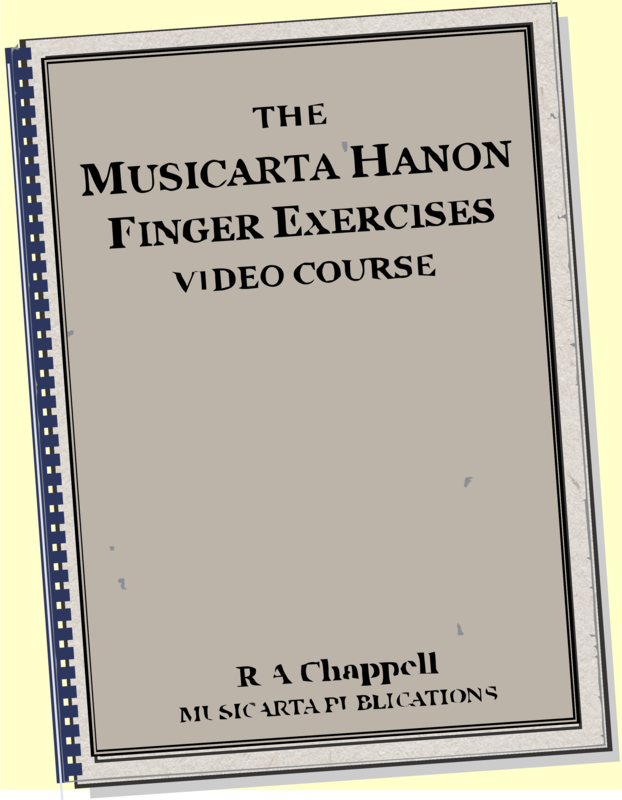 There is a MidiPiano performance video of all the practice patterns in this module at the end of the page. Please work right through the module before using the video for revision - otherwise, you will risk missing a valuable opportunity to hone your reading skills. This is an instruction you will see often if you study the beat and rhythm of popular music. The instruction tells you to play the even quavers ‘with a triplet feel’ or 'shuffle'. You can hear the effect of this instruction in the audio clip above. If you play the music with even quavers - ignoring the 'swing quaver' instruction - it will sound like this. Not nearly as attractive! The swing quaver instruction applies throughout this module. 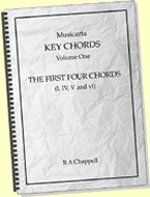 What has happened to the basic four pairs of notes in this performance? The right hand plays the notes twice too, and adds a next-door (below) quaver as well. You can hear that clearly in the audio clip – just copy and repeat until you get it right. 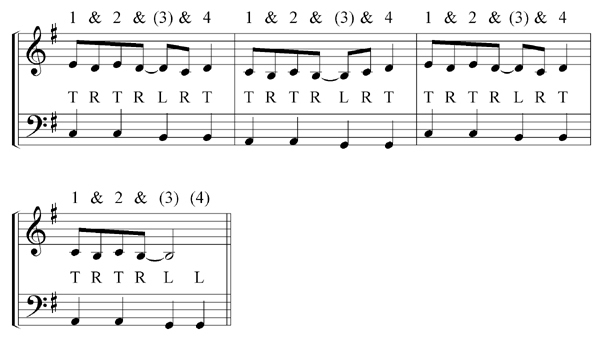 If you want to get on top of catchy rhythms, you must learn to ‘count’ music. The basic count for this music therefore is the “One, two, three, four…” written underneath it. Count along to the audio clip. You’re counting out what the left hand is playing, not the right or both. To count the quavers in the right hand, we have to use ‘and’ (&) for the in-between notes. Count aloud, to the audio clip, the numbers above the music – what the right hand is playing. 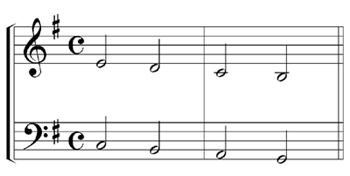 Notice that the right hand doesn’t play on beat 4 of the second bar, so the number is in brackets (4), and, if you can, you should whisper the ‘four’! just the left hand plays (L). This is what Musicarta calls ‘together-left-right (TLR) analysis’. Play the segment to yourself note by note and verify that the TRL analysis is correct. As the rhythms get more complicated, remembering to stop and do a TRL check gets more important. Tapping out the TLR pattern on the case of your instrument or your desktop before you even think about the notes is a particularly efficient use of your practice time and energy. The sample we have so far cries out for the last right hand note to be pulled forward off its beat onto the ‘and’ before. Just listen to how natural this sounds. Count the right hand and do your own TLR analysis. See if it agrees with this. We call the note that moved forward the “anticipated ‘three’ note”. We say it now comes on “two’s ‘and’”. Just tap out the second bar in preparation for playing. This is a Musicarta ‘beat map’. 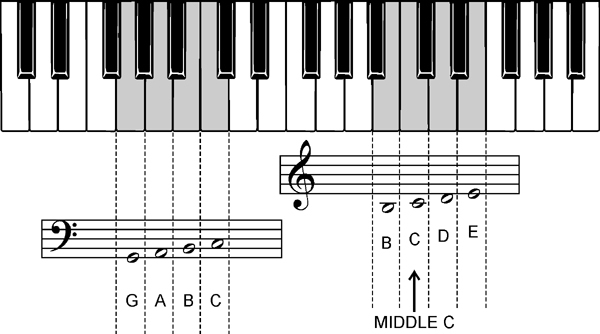 The up-stems notes indicate the right hand, the down-stems the left. It shows you the TLR ‘events’ as discussed above, without the actual music to complicate things. 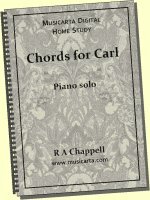 If you have any trouble playing that tricky anticipated right hand note without upsetting the steady four-four in the bass/left hand, practice tapping the pattern away from the keyboard first. Repeat the segment (both tapping and playing) until it feels quite natural. Count out loud as you play if you possibly can. Here is the next segment. Listen to the audio and read the paragraph below the music before trying to play it. This segment is twice as long. The second half is exactly the same as the previous segment. The first half is the same as well except for two right hand notes on “& 4” in the second bar. 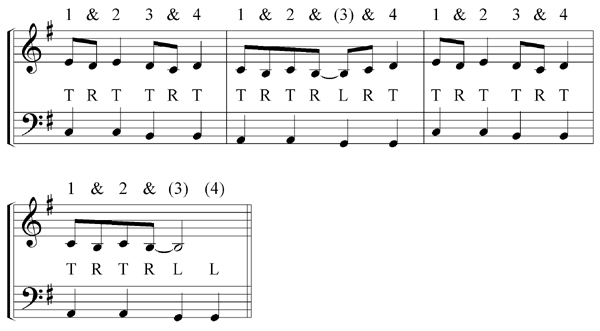 That is the only new material – the right hand climbs back up to note E for the repeat. Find the two new notes in the music, listen out for them in the audio clip, and play away. Here is the next segment. Now we play “right-left” on & (3), & (1), and on & (3) again. Once you can play the segment above, double the length with the ‘joining up’ bar. The music and audio have the second half starting with an “anticipated ’one’” as well. 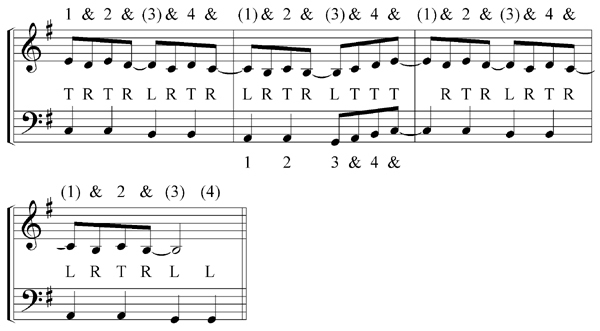 Apart from the first note, every right hand beat 1 and 3 is now anticipated. Now that we have anticipated all the odd-numbered beats, it's time to develop the ‘joining up’ bar. This is purely a practice segment. Listen to the audio carefully. Now put the developed ‘joining up’ bar to use. 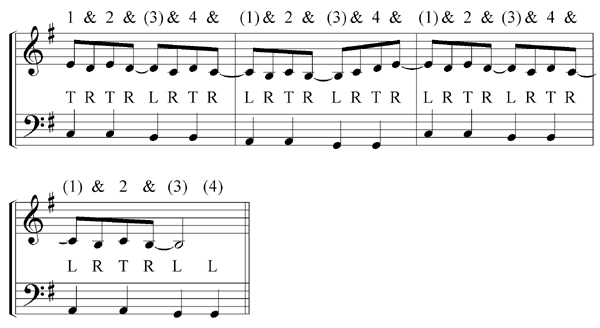 The rhythm you just learned actually comes in the second half of the bar. 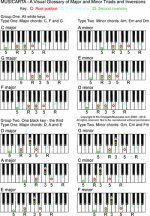 Here are all the practice patterns in a MidiPiano video performance. 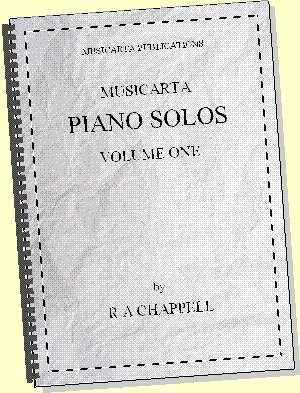 Each pattern (including the 'theme') is played twice as indicated in the titles. Watch the video as you read through the patterns in the workbook, then try playing along. 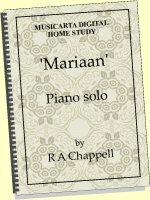 Make sure you can play this material well before going on to the next module. Going over the material several times is very fruitful in the long run. 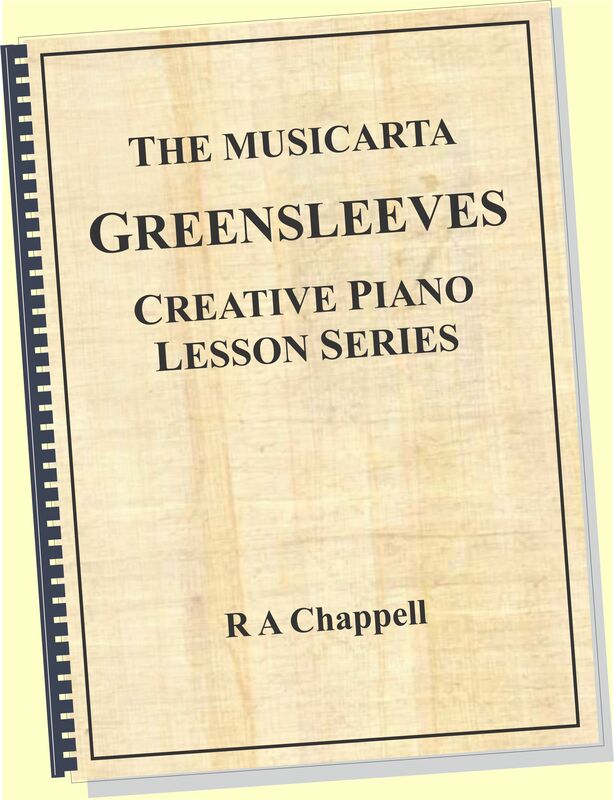 You might find working through the Tapping Exercises series at the same time profitable.